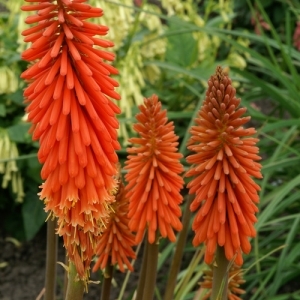 Dense spikes of tubular 1-2”/2.5-5 cm flowers bloom over semi evergreen tufts of stiff narrow grey/green leaves. Plants prefer an average to rich, very well-drained soil in full sun. Established clumps are best left undisturbed. 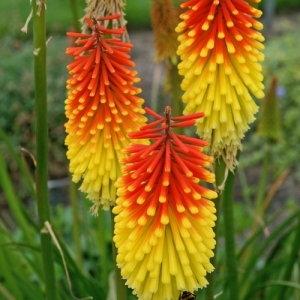 Torch Lilies provide bold and colorful vertical forms for the late spring and summer garden.